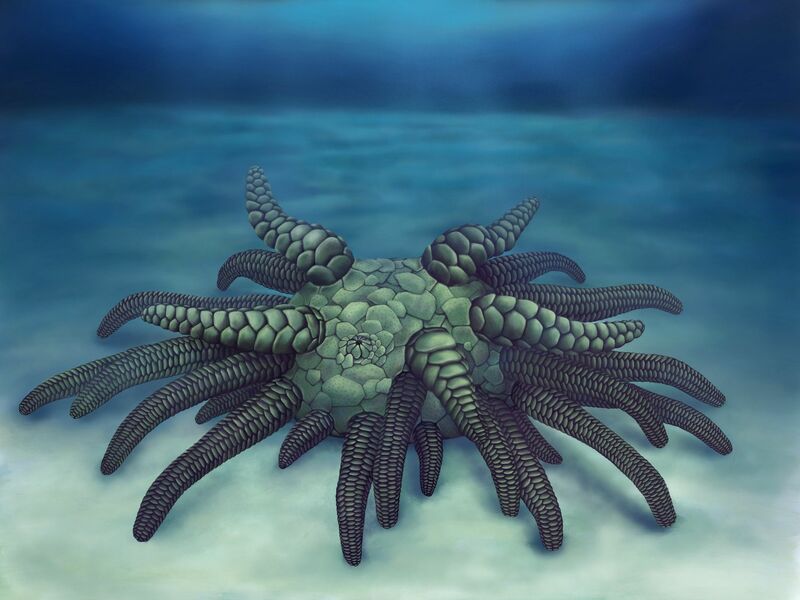 Researchers have discovered an exceptionally well preserved fossil in 430 million-year-old rocks representing a new species of primitive sea cucumber, which they have named Sollasina cthulhu due to its resemblance to the sea deity from H. P. Lovecraft’s fictional universe. An international team of paleontologists created an accurate 3D reconstruction of the remains—which were discovered at a site in the U.K. county of Herefordshire—revealing an important circulatory system which was previously unknown in this group of animals, according to a study published in the Proceedings of the Royal Society B. The researchers say that while the newly described creature looks like a kind of sea urchin, it actually belongs to an extinct group of echinoderms called "ophiocistioids" which, according to their analysis, are ancient relatives of sea cucumbers—a group of leathery-skinned, marine animals with elongated bodies that live on the sea floor. “In terms of its morphological characteristics, Sollasina cthulhu was characterized by the presence of 45 tentacle-like tube feet, a body composed of many hard plates, and a mouth surrounded by five large ‘teeth,’” Imran Rahman, lead author of the study from the University of Oxford, told Newsweek. The fact that the roughly one-inch-wide fossil was so well preserved allowed the scientists to create an exceptionally accurate 3D virtual model of its anatomy. Using this reconstruction, the team were able to identify inner soft tissues which have never previously been seen in a fossil of this kind. The S. cthulhu fossil is just one of many important discoveries at the Herefordshire fossil site, which is well-known for the hard and soft body structures that have been found there.